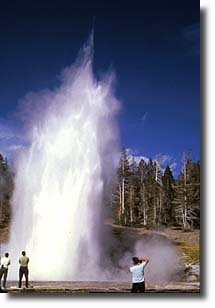 An eruption of Grand Geyser, the tallest predictable geyser in the world, occurs every 7 - 15 hours. A classic fountain geyser, Grand erupts from a large pool with powerful bursts rather than a steady column like Old Faithful. An average eruption lasts 9 - 12 minutes and consists of 1 - 4 bursts, sometimes reaching 200 feet (60m).